Originally published September 8, 2015 at ANTIMEDIA. 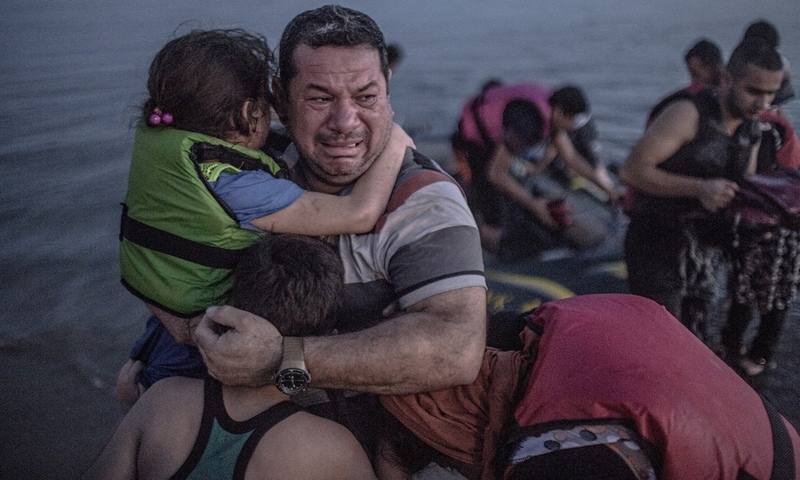 Another newsflash: this is what war displacement looks like, both in the sea and on dry land. What you see in his face is the anguish felt right this very moment by the many millions of mothers and fathers driven from their homes and sources of livelihood throughout the countries shattered by weapons from the West: Iraq, Syria, Libya, Afghanistan, Yemen, Somalia, Palestine, Ukraine, and more. And then they are stirred, not enough to actually learn a damn thing about it, but only enough to be manipulated into demanding — or at least countenancing — more of the very same kind of intervention that caused the tragedies in the first place. And the first step to setting things right is understanding. Make it a project to learn about the role of foreign intervention in the Syrian Civil War that is creating so many of these refugees, and in the wars roiling the Middle East, North Africa, and South Asia in general. And once you’ve acquired understanding for yourself, work to spread it to others. Also published at Anti-Media, Zero Hedge, and Medium.com. This article (Read This Before the Media Uses a Drowned Refugee Boy to Start Another War) is free and open source. You have permission to republish this article under a Creative Commons license with attribution to Dan Sanchez and theAntiMedia.org.